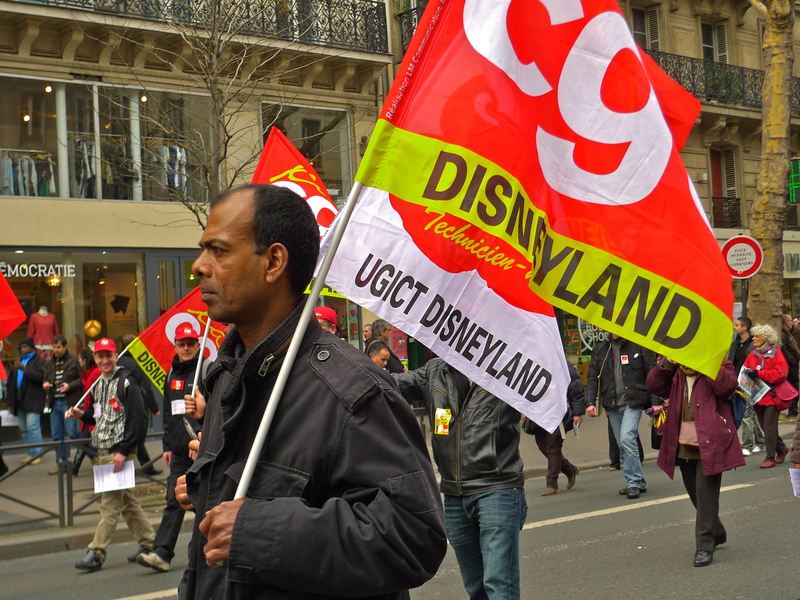 FOR SEVERAL MONTHS I’ve been following and recording the street demonstrations in Paris in response to the new French labour law, the law El Khomri. 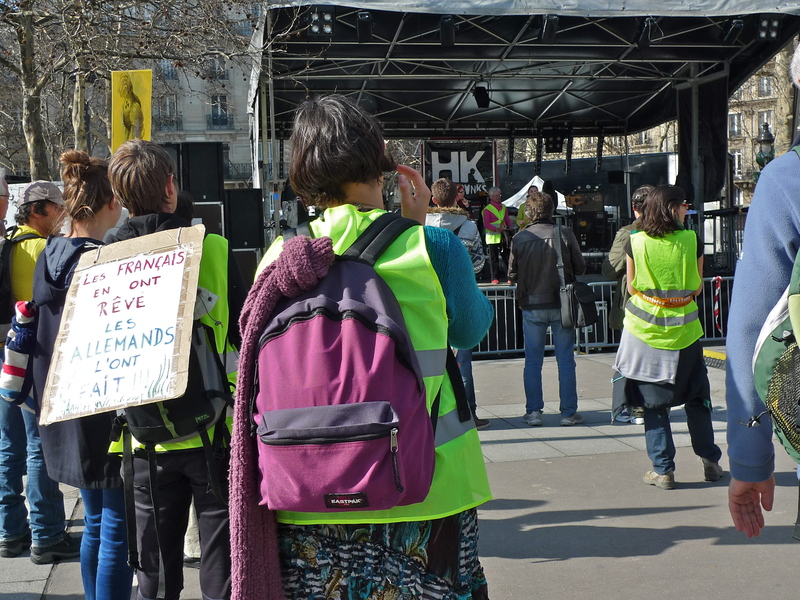 Demonstrations protesting against the new legislation have been taking place on the streets of Paris and across France since March this year and I’ve reported three of them on this blog; one in April, one on 1st May and one towards the end of May, the latter of which found me shrouded in a cloud of tear gas. 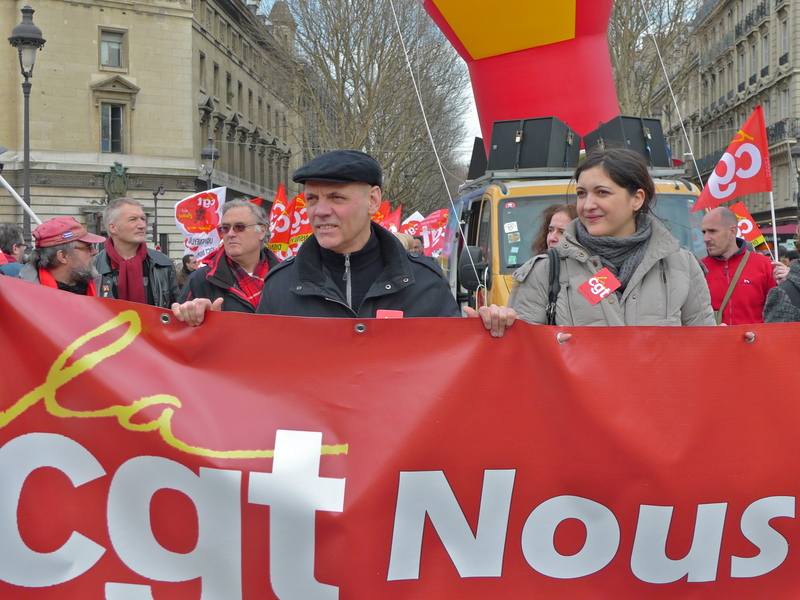 The government and many employers argue that the new labour law makes working practices more flexible thus helping to address the high level of unemployment but some unions, particularly the CGT, the country’s largest trade union, see it as toxic; too pro-business and making workers’ positions more precarious. 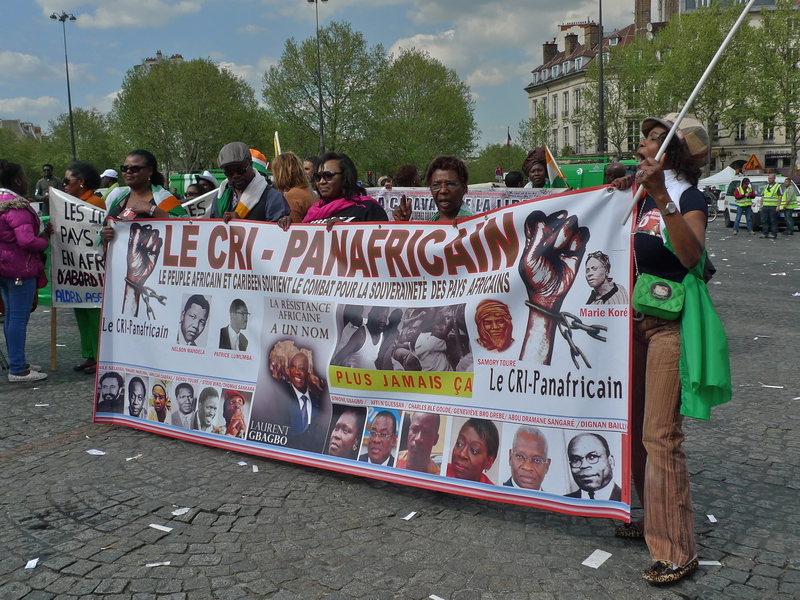 Since the government forced the legislation through the Assemblée Nationale in May using emergency constitutional powers to avoid a vote that it would almost certainly have lost, the street demonstrations have become increasingly violent. 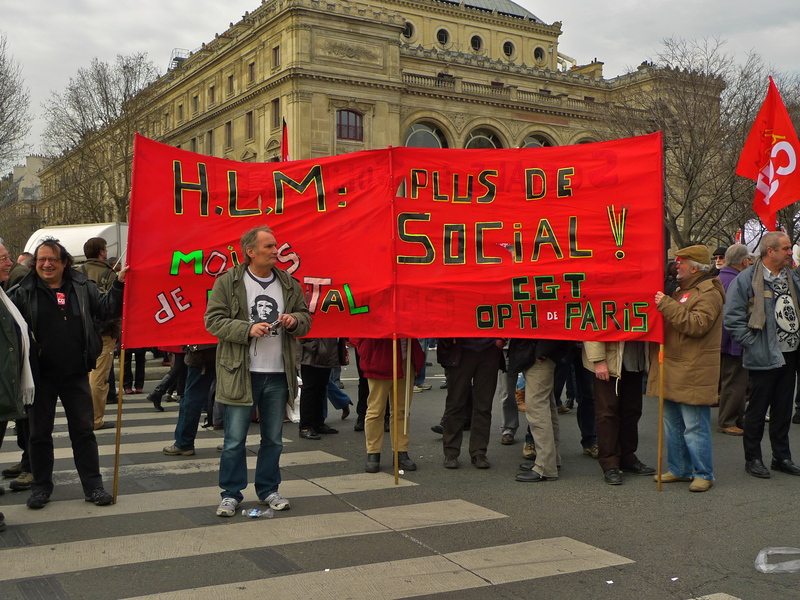 To coincide with a debate about the new labour law in the French Senate, protestors took to the streets again last Tuesday. 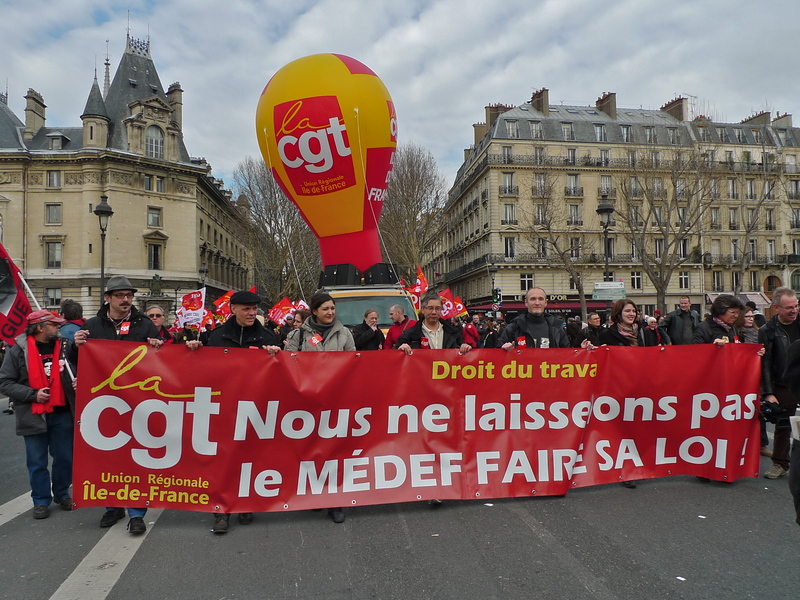 Organised by the CGT union, who reportedly laid on some 600 buses to ship people in from around France to swell the numbers, Tuesday’s demonstration was one of the largest and certainly the most menacing I’ve seen in my seventeen years of observing street protests in the city. 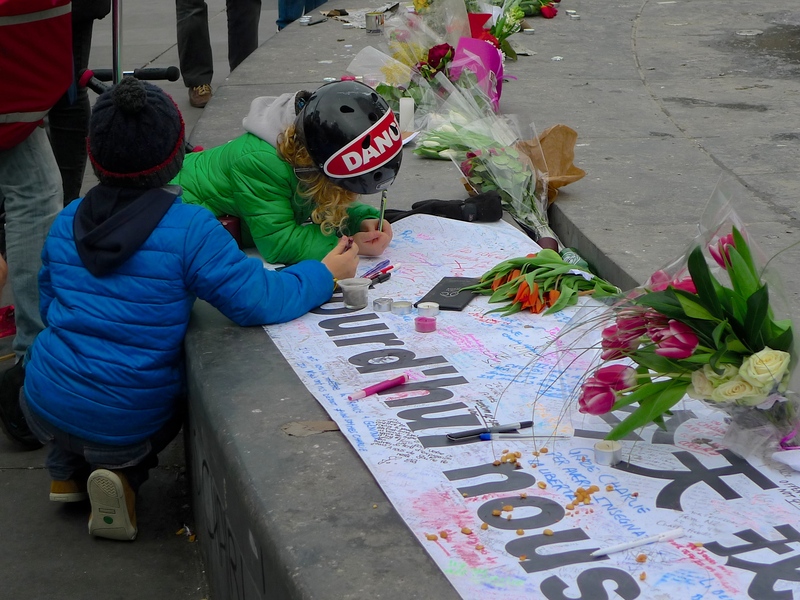 At the head of the demonstration were the casseurs, the hooded and masked youths intent on creating havoc – and that’s exactly what they did. 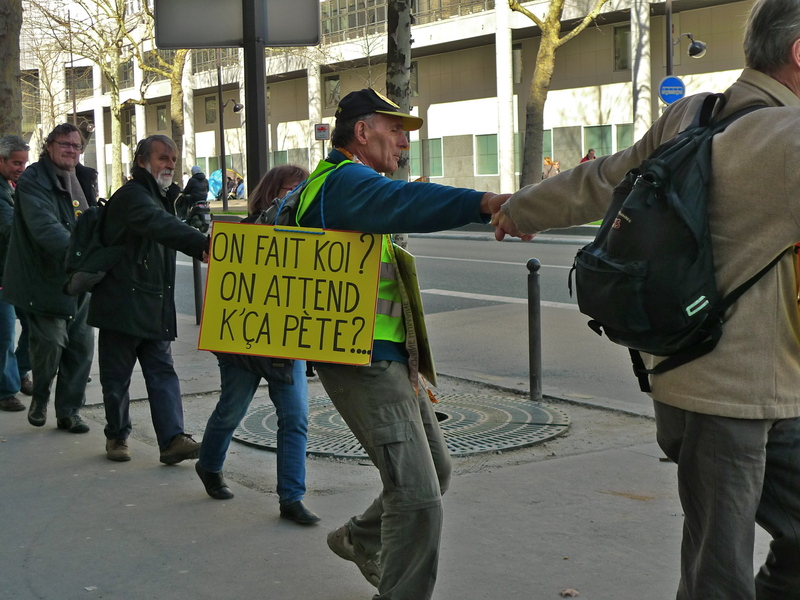 I followed the demonstration from its starting point in Place d’Italie until it reached Boulevard Montparnasse where violence broke out as demonstrators stormed a building site and began to hurl wooden palettes at riot police. 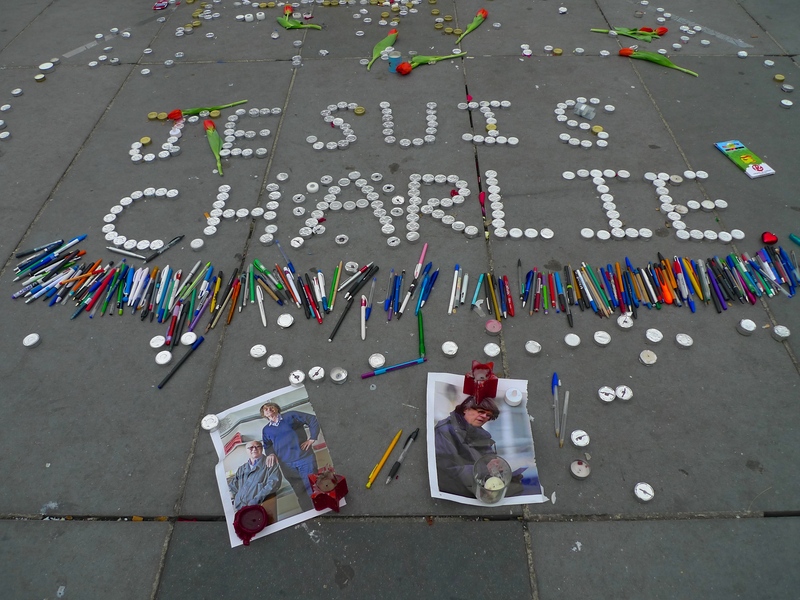 When a group of casseurs then attacked and trashed the ground floor of the Hôpital Necker, the Paris Children’s Hospital, I decided that enough was enough. I stopped recording and left. 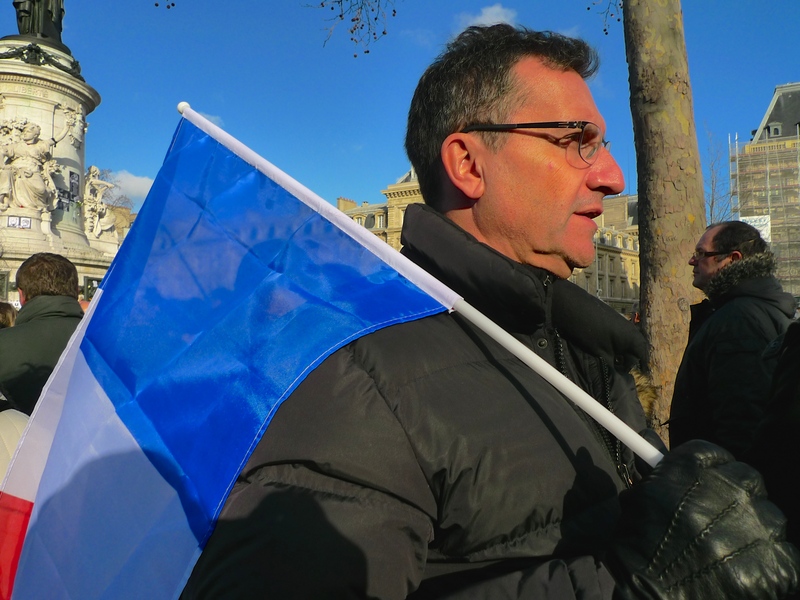 Philippe Martinez, leader of the CGT union, blamed hooligan elements on the fringe of the protest for the attack on the hospital saying it was ‘scandalous’ and ‘completely unacceptable’. And he may be right. 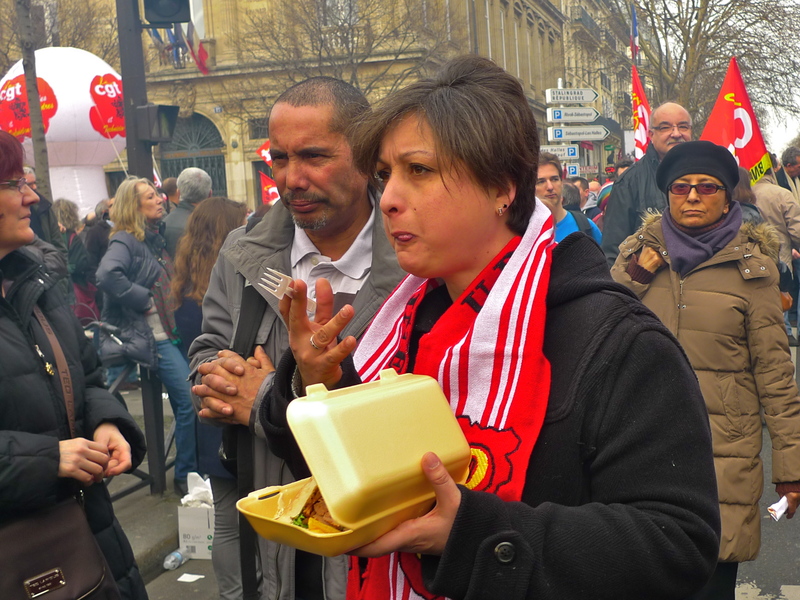 But hooligans aside, there was a tone to Tuesday’s demonstration that seemed to make violence inevitable. 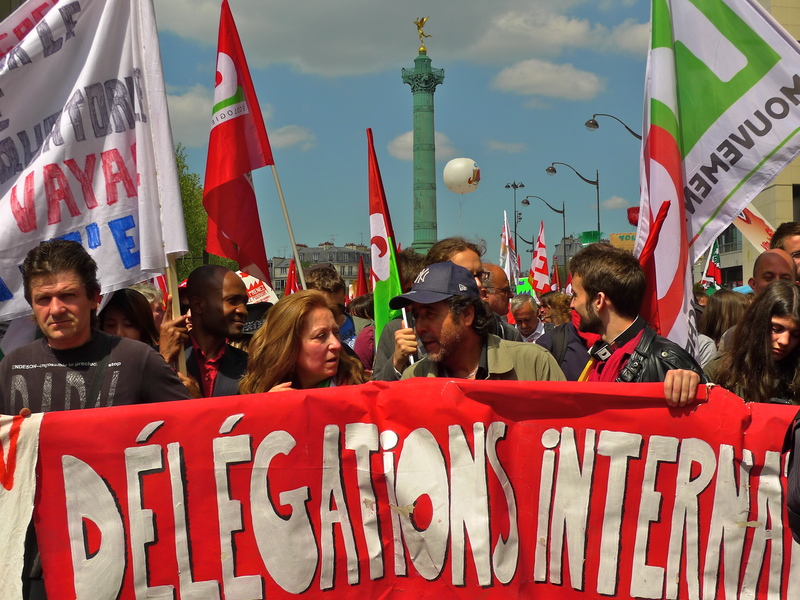 Faced with the current impasse between the French government and the CGT further demonstrations are planned for the 23rd and 28th June. It remains to be seen to what extent the government are frightened of the people, assuming the CGT can be considered to represent the people. In any event I shall not be there to record what happens. The attack on the children’s hospital was only one of the disgusting acts I saw on Tuesday – and not only from the ‘hooligans’. For me, enough is enough! 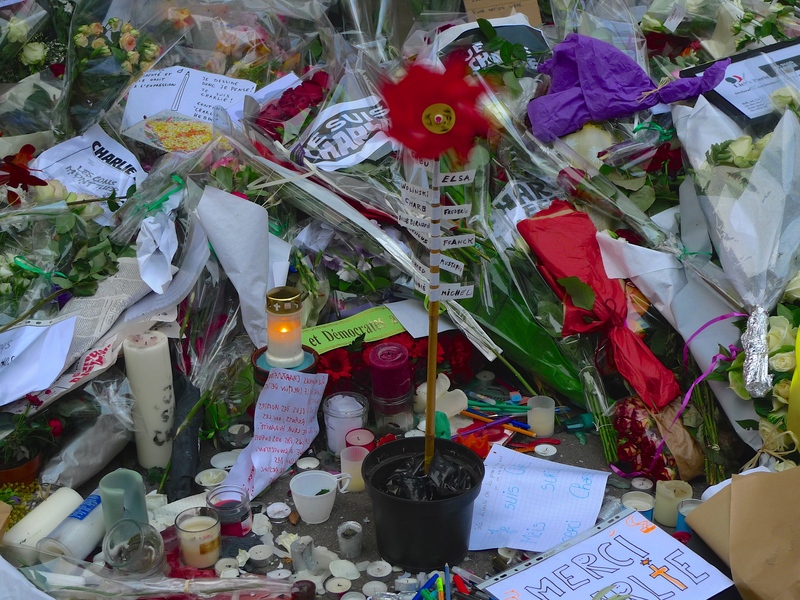 I did record the sounds of the violence in Boulevard Montparnasse and the trashing of the children’s hospital. The recordings have been consigned to my Paris Soundscapes Archive so they will be available to researchers in the future but I thought the sounds inappropriate to include here. MY WEEK HAS BEEN fascinating. It has stretched from the beautiful city of Wroclaw, the largest city in western Poland and the European City of Culture 2016, to the streets of Paris and a cloud of tear gas! From the 19th to the 22nd May, the city of Wroclaw hosted the Musica Electronica Nova Festival during which I was invited to perform my field recording composition, Paris – A Sound Tapestry, in the Sound Cinema at the impressive National Forum of Music and then to give a lecture, Listening to Paris, at the Institute of Musicology at the University of Wroclaw. I also had the opportunity to meet up with my friends from the Soundscape Research Studio, part of the Institute of Cultural Studies at the University of Wroclaw, and to do a soundwalk around historic Wroclaw with them. I couldn’t have been in better hands because my friends have written a book about the Wroclaw soundscape: The Sounds of Wrocław, edited by Renata Tańczuk and Robert Losiak, published by Wrocław University Press. And as a bonus, before flying back to Paris I was taken to see the Hala Stulecia, the Centennial Hall. This ‘cathedral of democracy’, a milestone in the history of reinforced concrete architecture, was designed by the architect Max Berg and built between 1911 and 1913. When it was opened, the Hala Stulecia was the largest reinforced concrete structure in the world. Today, it is a UNESCO World Heritage Site. My trip to Wroclaw was idyllic; a beautiful city, charming people and glorious sunshine every day. My return to France on the other hand was quite different. 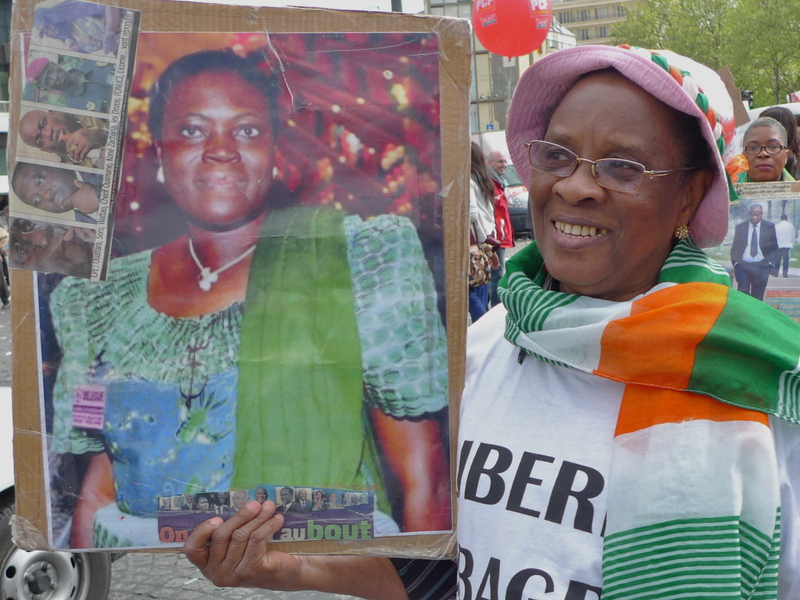 I came back to a country mired in protests and strikes paralysing power stations, oil refineries and the railways and the country’s largest trade union, which at best only represents 3% of the workforce, seemingly determined to bring the government to its knees. 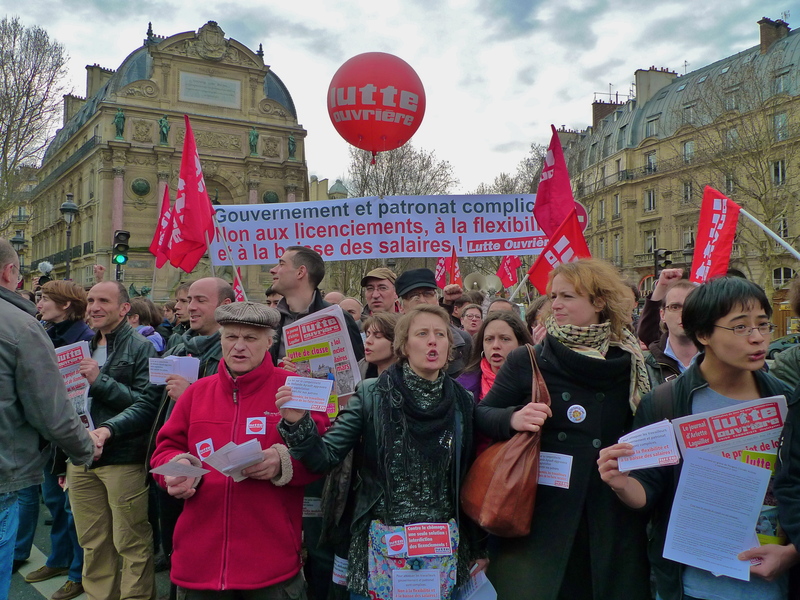 The turmoil began earlier this year, after the government announced it wanted to make changes to the Code de Travail – a 3,000-page book that sets out all of France’s employment law. 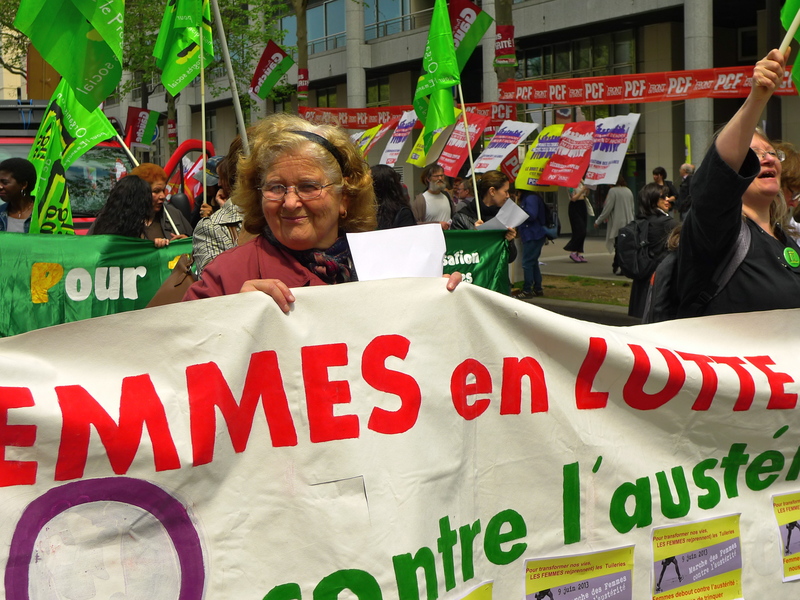 Earlier this month, the government forced a watered down version of its new labour law, the Loi El Khomri as it’s known, through the French parliament without a vote. Since then industrial action has escalated sometimes spiralling into violence. 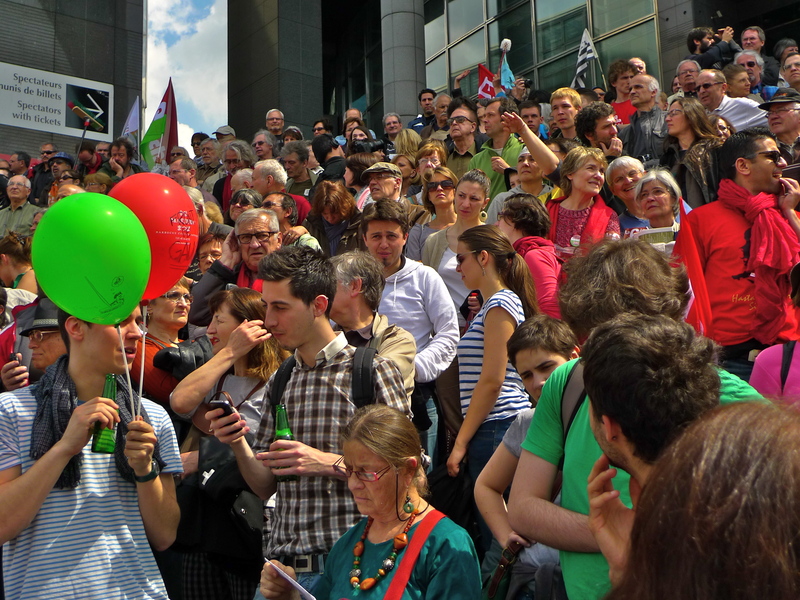 Thursday of this week saw yet another national day of protest against the government’s proposals, the eighth so far. 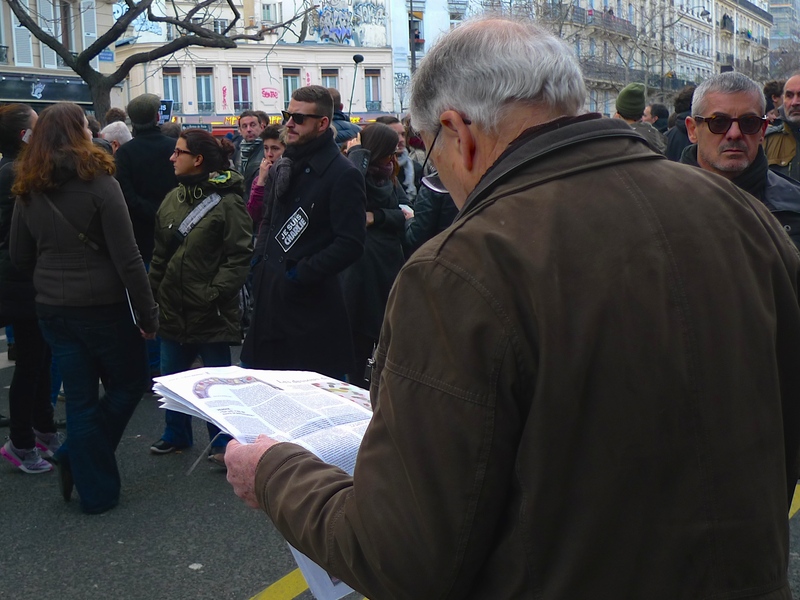 Thousands of people took to the streets of Paris and so, with my sonic journalist’s hat on, I went to record what was inevitably going to be a major news event. 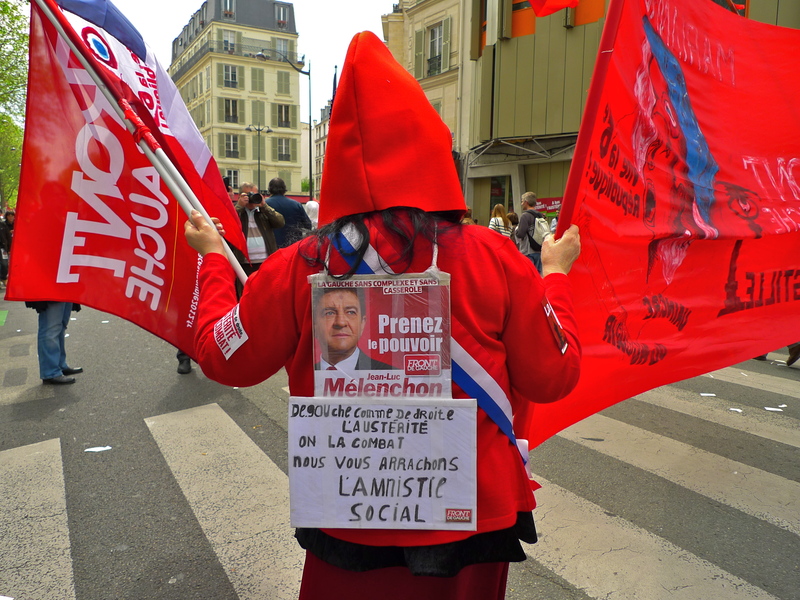 When you’ve attended as many street protests in Paris as I have it’s easy to become complacent and think that they all follow the same formula and they’re all predictable. And often they are; the same people carrying the same banners, chanting the same slogans and sometimes getting angry but without resorting to violence. 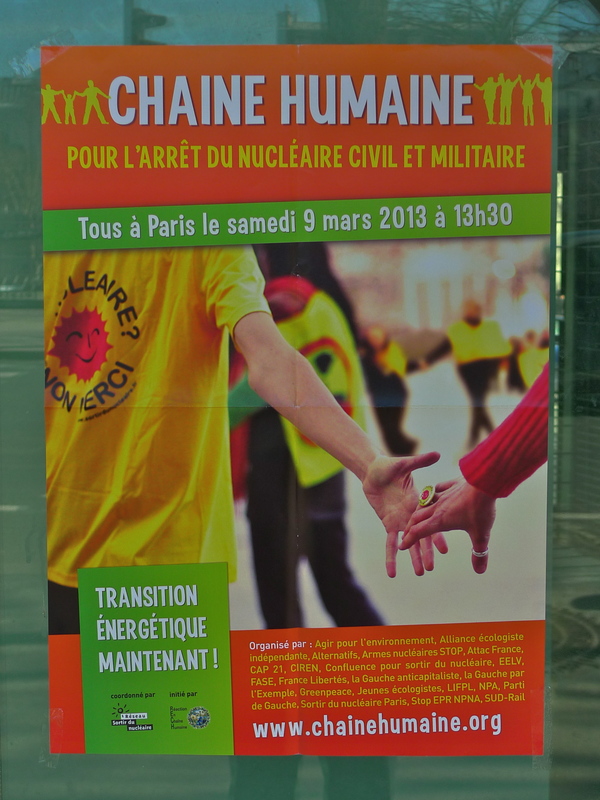 But this demonstration was different. Youths wearing face masks, eye protectors, gas masks and crash helmets had clearly not come out for a walk in the park. Whilst the vast majority of the demonstrators were content to wave their banners, chant their slogans and get angry, a small minority, mainly youngsters, were intent on taunting the police and instigating violence – and they were clearly equipped for the consequences. 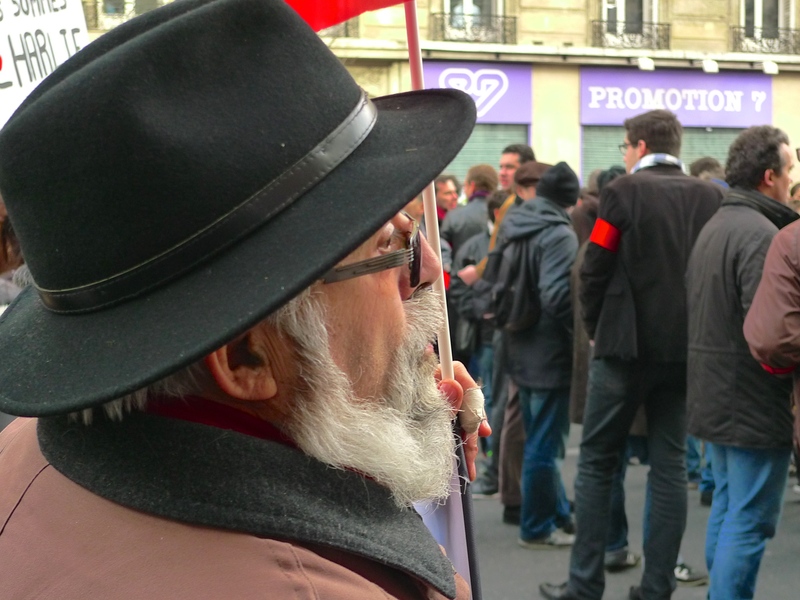 I joined the manifestation as it left Place de la Bastille and made my way to the front where about 100 youngsters were assembled. 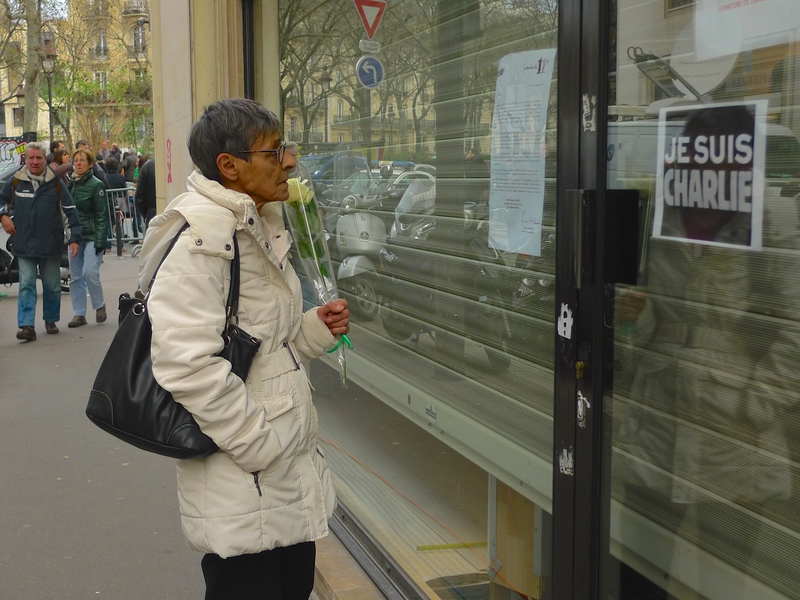 Some of them broke ranks to leave their mark on nearby shop windows. 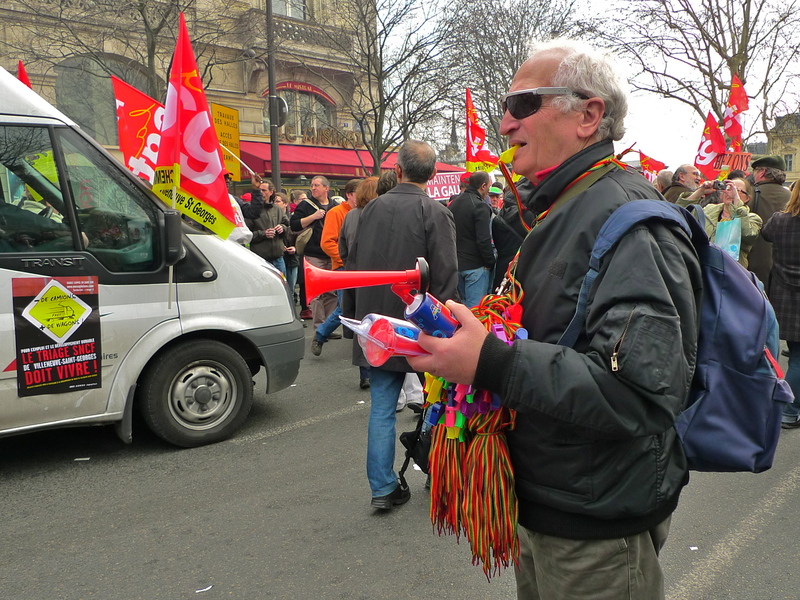 The CRS (Compagnies Républicaines de Sécurité), the riot police, maintain a discreet presence at all demonstrations in Paris. They are seldom to be found on the main manifestation route but rather out of sight in side streets well away from the protestors from where they can be called upon if necessary. The youngsters at the head of the manifestation, intent on confrontation and responding to the exhortation, “Avancez! Avancez!” by one of their leaders, deviated from the official route into a side street where the CRS were waiting for them. As the youngsters advanced, trashing cars, overturning motorcycles and wrecking a bus stop as they did so, the police formed up across the end of the street and slowly moved forward towards them. 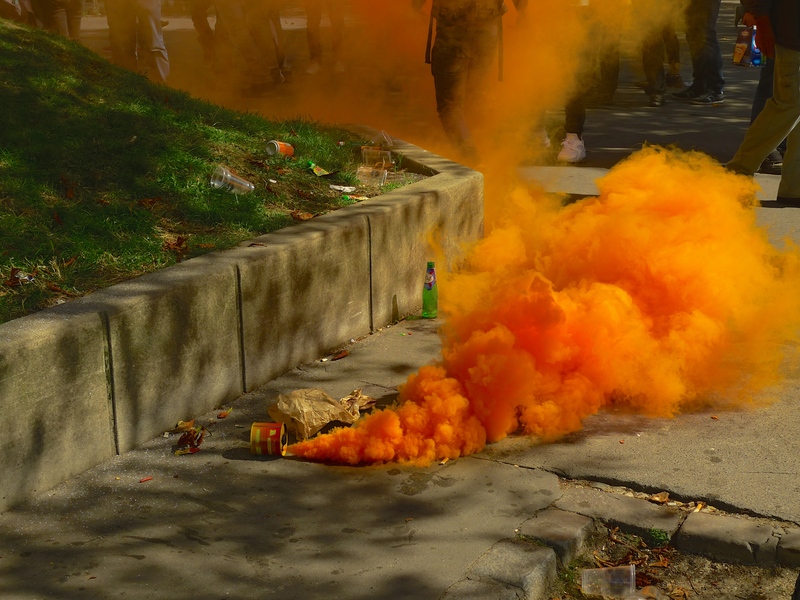 As the police approached, the youths began hurling stones and any other objects that came to hand at them and at anyone else who happened to be nearby – including me. 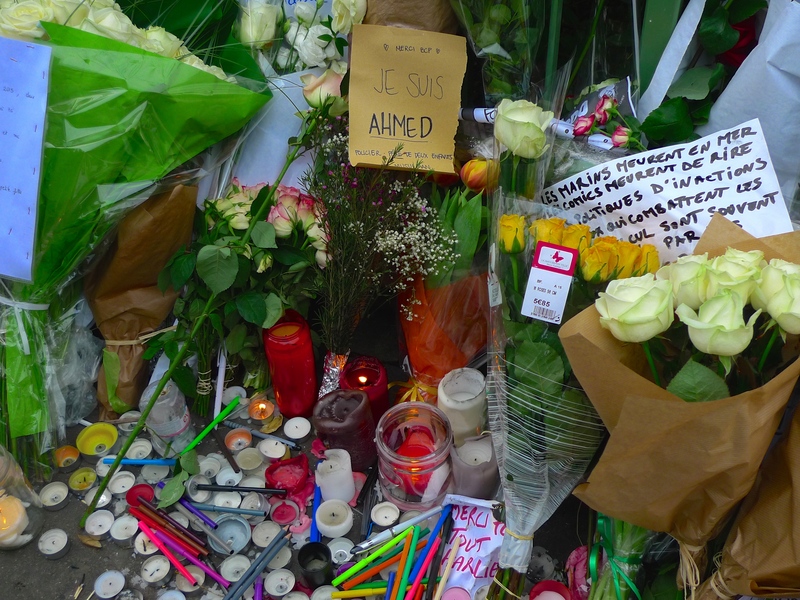 This provocation produced a response from the police – a fusillade of tear gas. Caught between the protestors and the police and smothered in a cloud of tear gas I had no alternative but to join some of the others caught in the mêlée and take flight in search of fresh air. 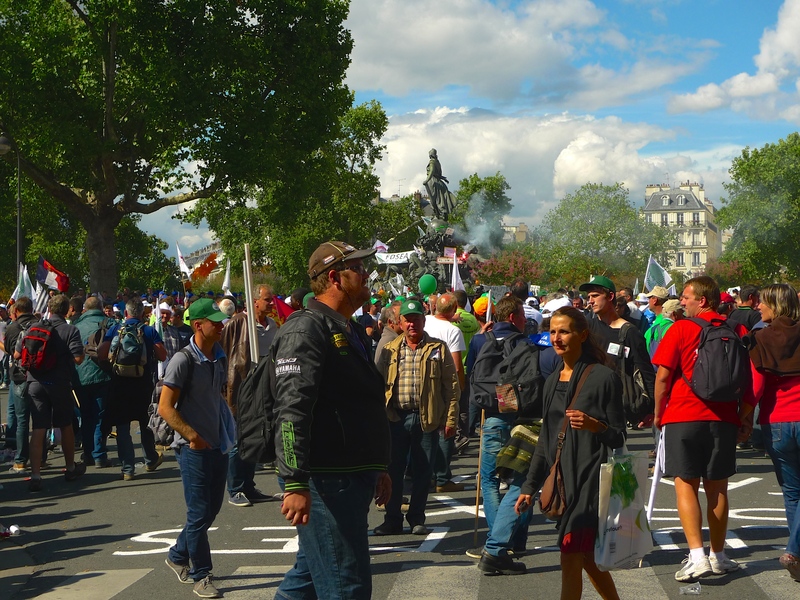 In total, sixteen arrests were made during this confrontation while the rest of the manifestation continued on to Place de la Nation without further incident. Unless the deadlock between the unions and the government is broken, another national day of protest is scheduled for 14th June – enough time then for me to buy a crash helmet and a gas mask! While my visit to Wroclaw this week was very special – an opportunity not only to see a beautiful city but also to share my work with others and to talk about sound with friends and like-minded people – recording the sounds of a riot in Paris on Thursday was simply all in a day’s work. 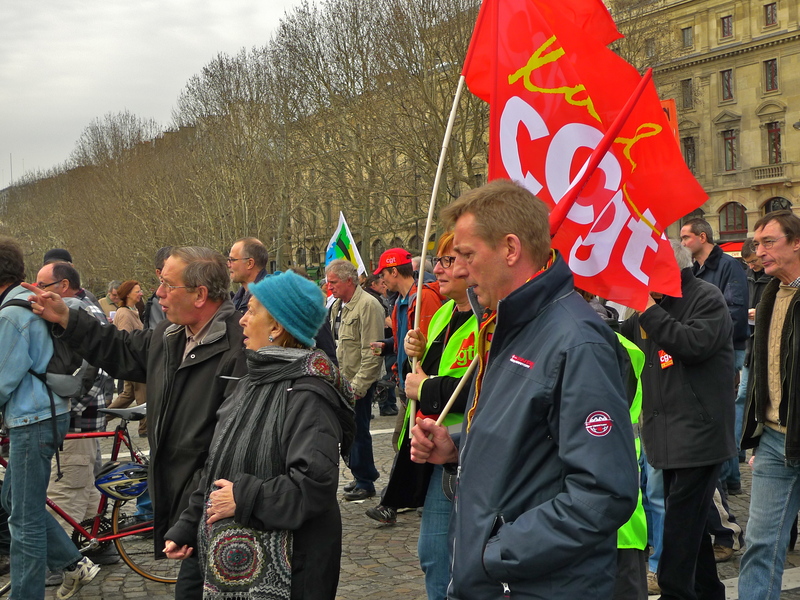 AHEAD OF THE PARLIAMENTARY debate about controversial changes to the French labour laws, people took to the streets of Paris again last Sunday. 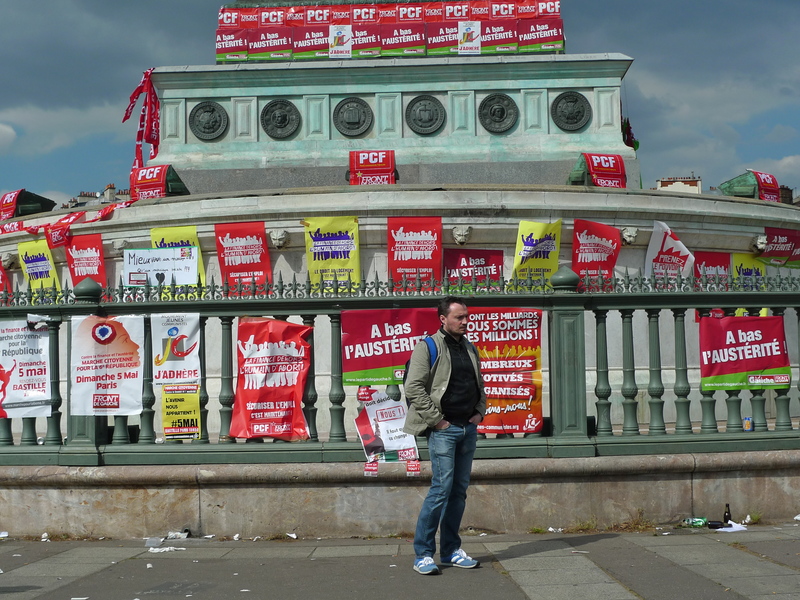 This May Day demonstration was another in a series of protests and strikes opposing the proposed changes embodied in the loi El Khomri. One characteristic of the opposition to the loi El Khomri is the active involvement of students in the protests. 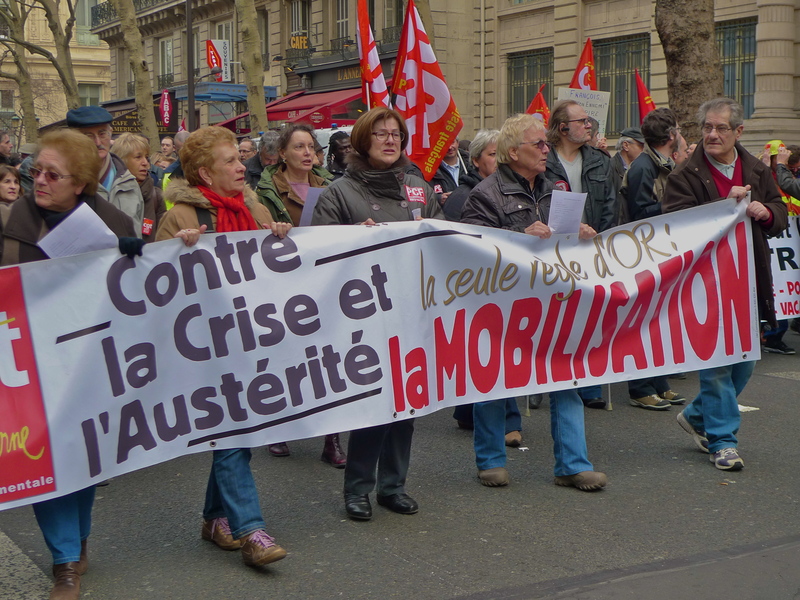 France has a long history of youth protest movements – from May 1968 to the rallies against pension reform in 2010 – but a relatively new phenomenon has emerged this year, the Nuit Debout (Arise at Night), a movement similar to the Occupy initiative that mobilised hundreds of thousands of people in 2011. 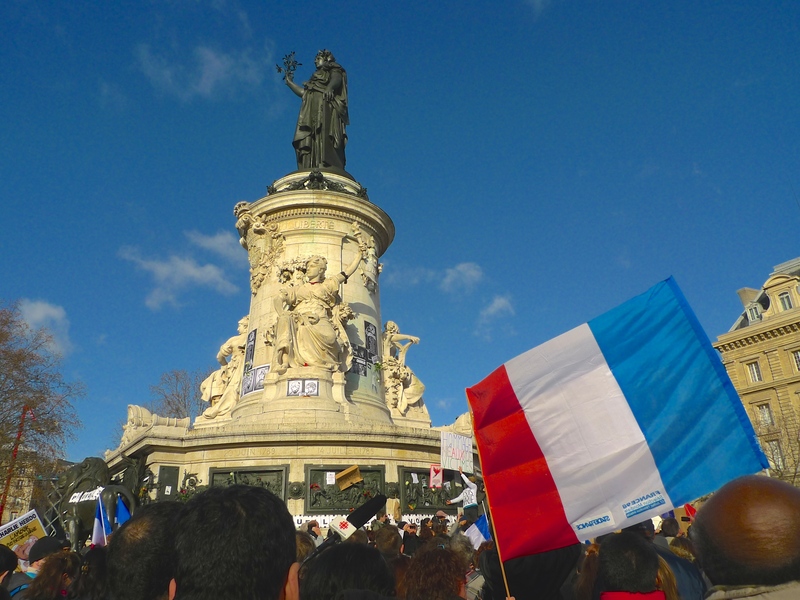 Since 31st March this year, students and others have been ‘occupying’ Place de la République in Paris throughout the night to ‘reflect on the future of our world’, according to their website. 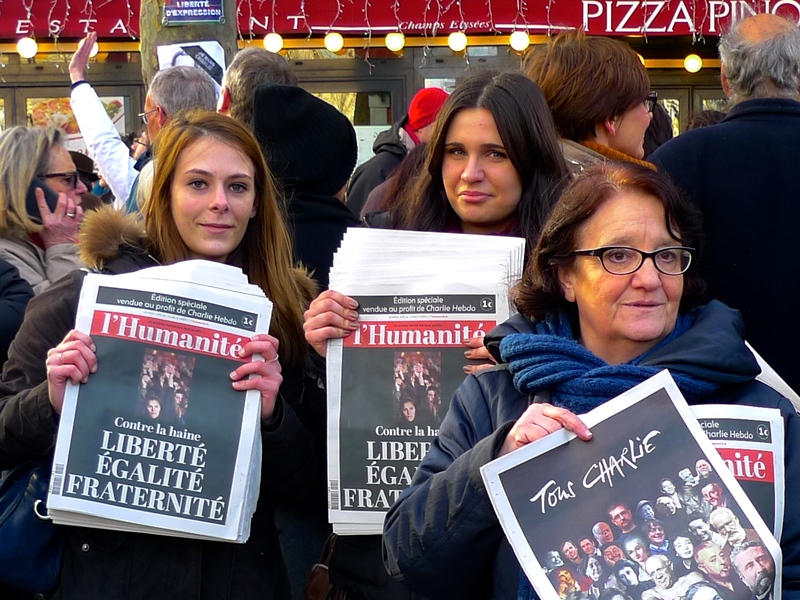 Similar movements have also sprung up elsewhere in France. 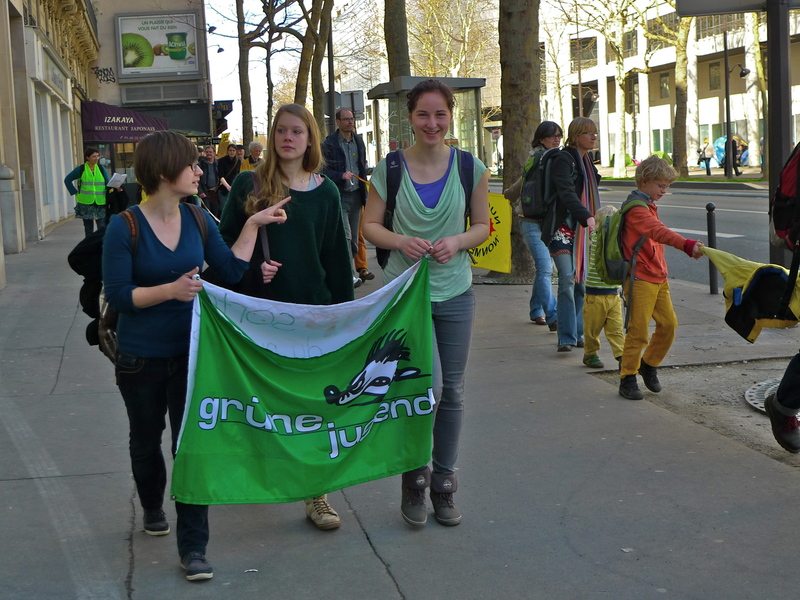 And students have been particularly vociferous in their opposition to the loi El Khomri. 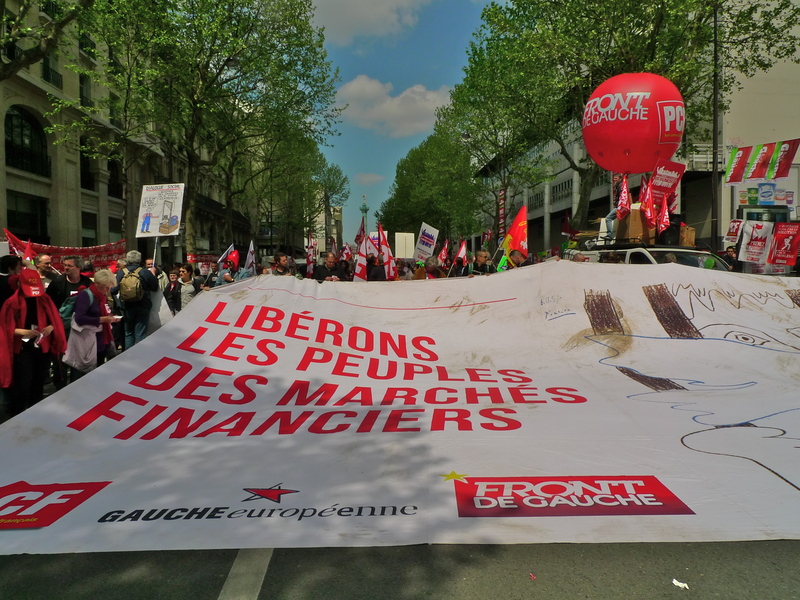 Leading the official May Day manifestation in Paris were representatives of Force Ouvrière, one of the five main union federations in France and ahead of them, in an unofficial demonstration, were students under the watchful eye of the police. And, of course, I was there too recording the events. 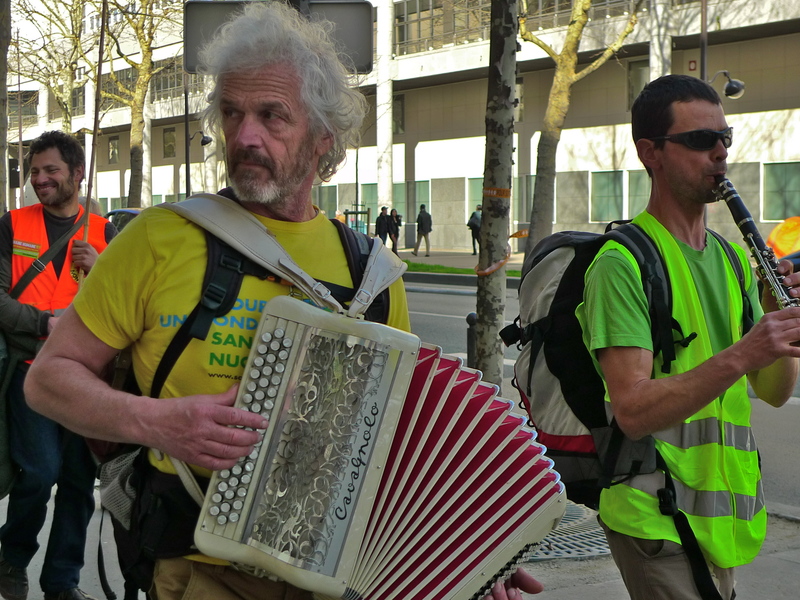 I arrived in Place de la Bastille to find a large collection of musicians occupying the steps of the l’Opéra Bastille. 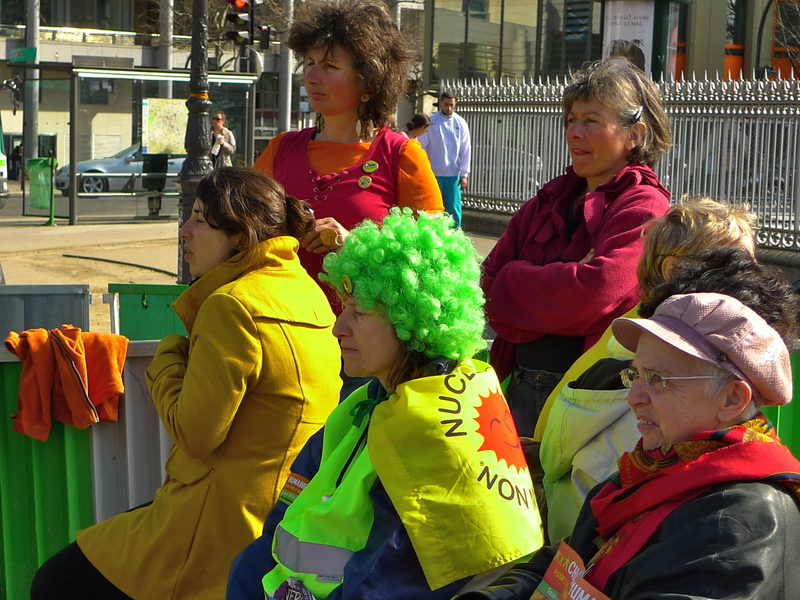 I stopped to listen to them for a while before making my way along the line of demonstrators forming up in Rue de Lyon. 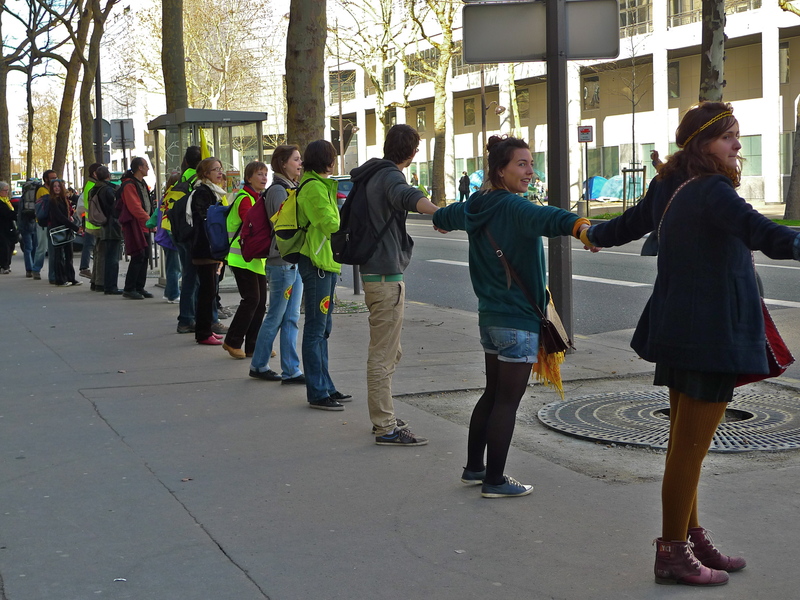 At the head of the line was the Force Ouvrière contingent together with burly men forming a protective cordon. Inside the cordon the press pack were gathered, radio, TV and newspaper journalists, and so I joined them. Surviving in the midst of a predatory press pack could be the subject of a blog post all of its own but suffice it to say that with considerable chutzpah and judicious use of my elbows I managed to get close to the front of the pack to record the secrétaire général de Force ouvrière, Jean-Claude Mailly, speaking to the press. You can listen to what he had to say five minutes into my sound piece above. 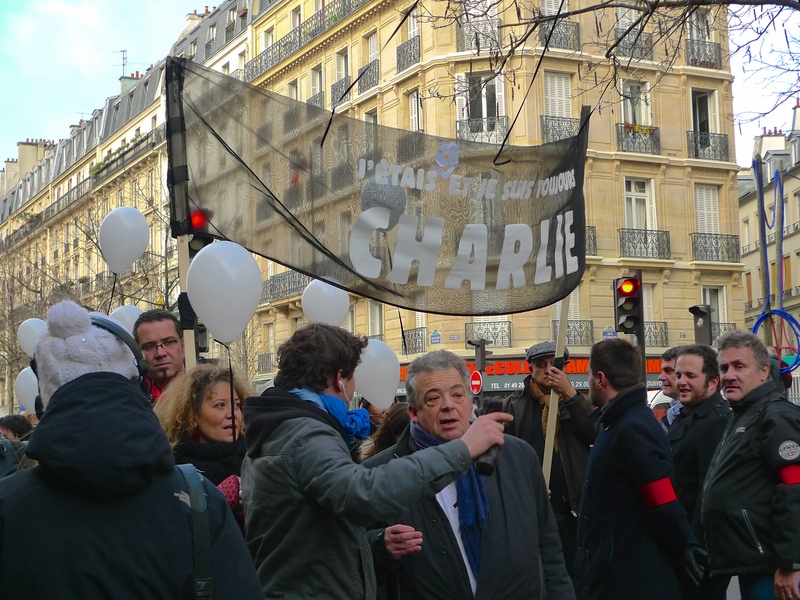 When he was asked about the prospect of violence occurring during the demonstration, Monsieur Mailly said that he was only responsible for the actions of his group and not for the actions of others and the police were there to prevent violence. No sooner had he said that than the first arrest of the day was made just a few metres ahead of us to which the crowd responded. One of the unpleasant features of the recent demonstrations has been the presence of casseurs (smashers or breakers) – hooded or masked youths infiltrating demonstrations, smashing shop windows, torching cars, beating and robbing passers-by and throwing assorted missiles at the police. 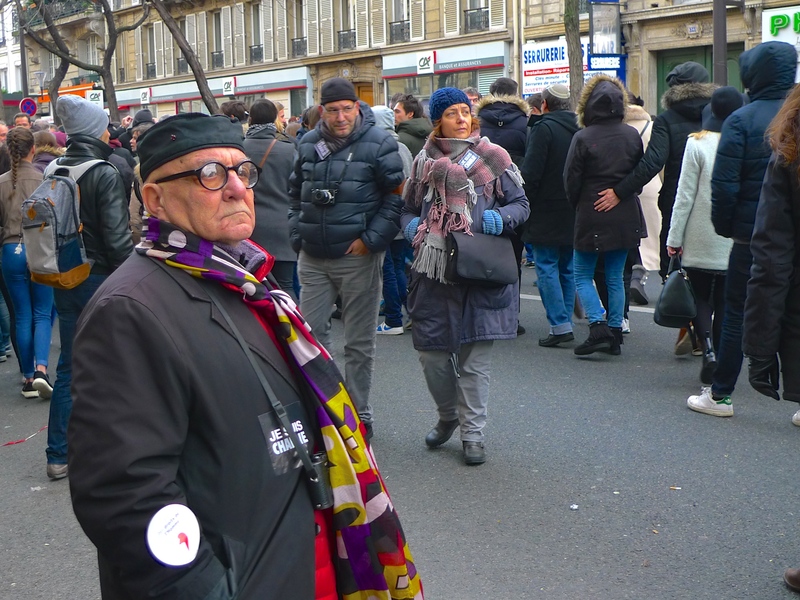 The young man arrested close to us was one of these casseurs. 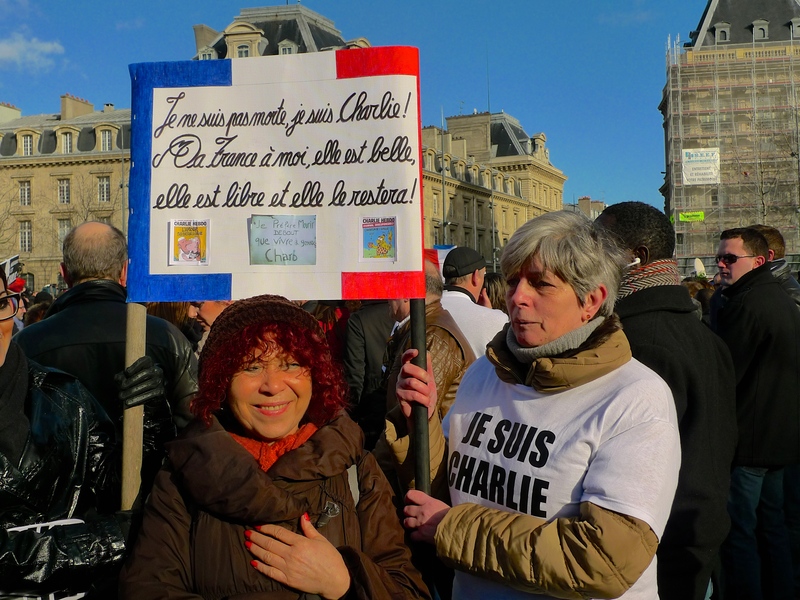 The manifestation processed from Place de la Bastille to Place de la Nation but I didn’t go with them. 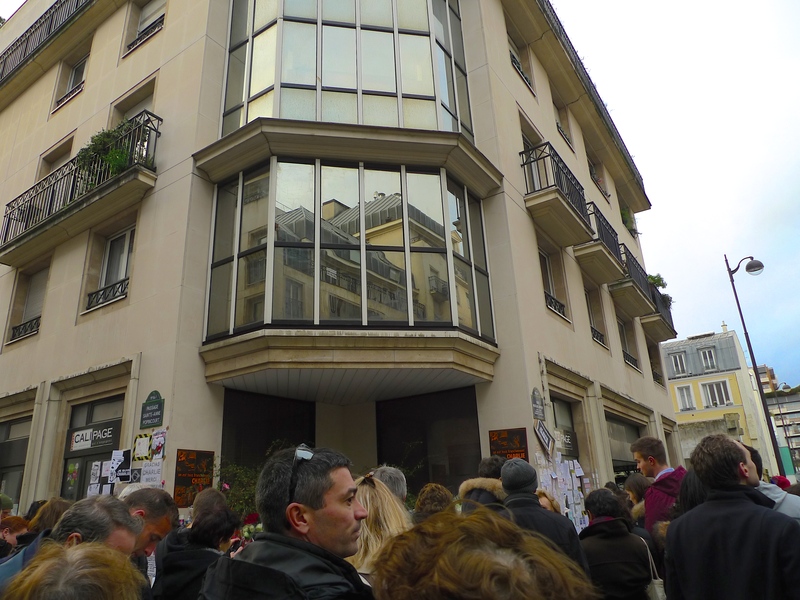 Instead, I stayed in Rue de Lyon and recorded all of the demonstrators as they passed me, the majority of whom were perfectly good-natured. 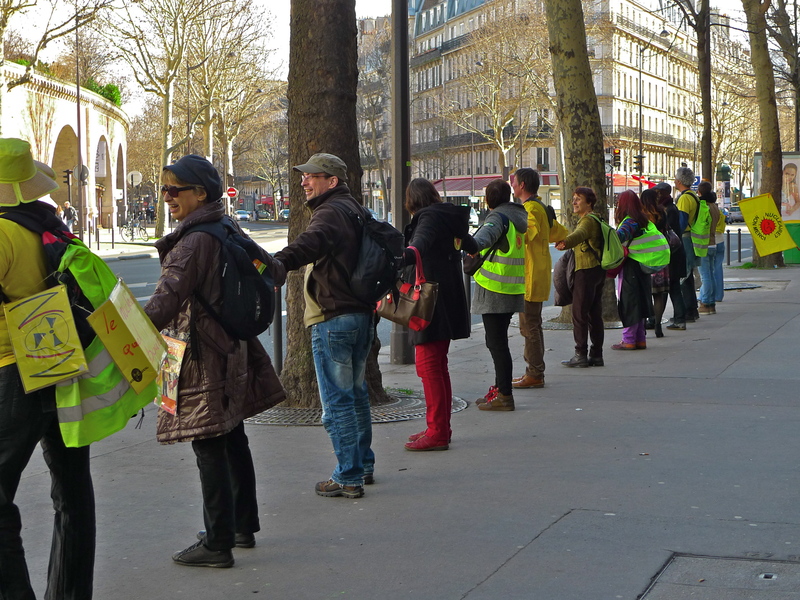 As I am writing this, the French parliament are debating the loi El Khomri and protestors are camped out in the streets making their voices heard. As it stands, the proposed new law pleases neither the unions nor the employers – and certainly not the students. How this impasse is resolved remains to be seen but I can’t help feeling that there could be many more recording opportunities still to come before the matter is settled. 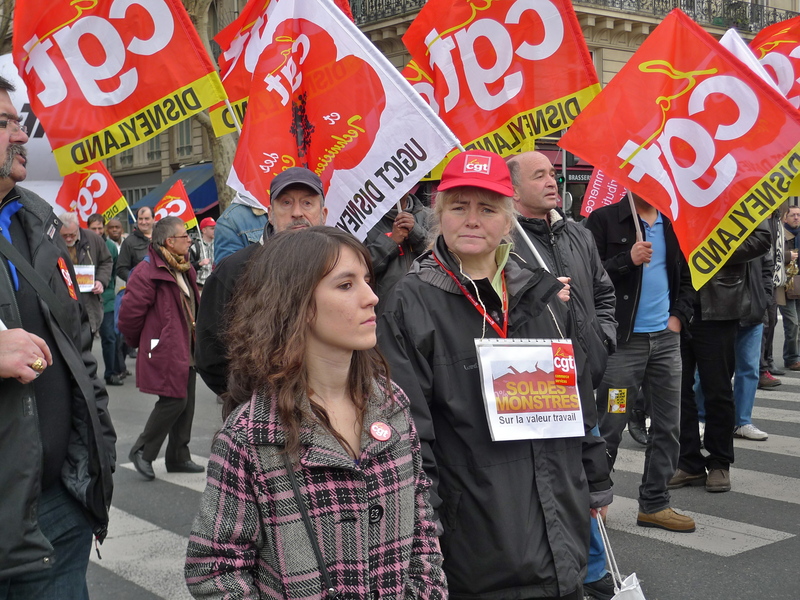 LED BY STUDENT GROUPS and labour unions, thousands of people gathered in Place de la République in Paris on Saturday afternoon to step up their campaign against the government’s controversial labour reform bill. 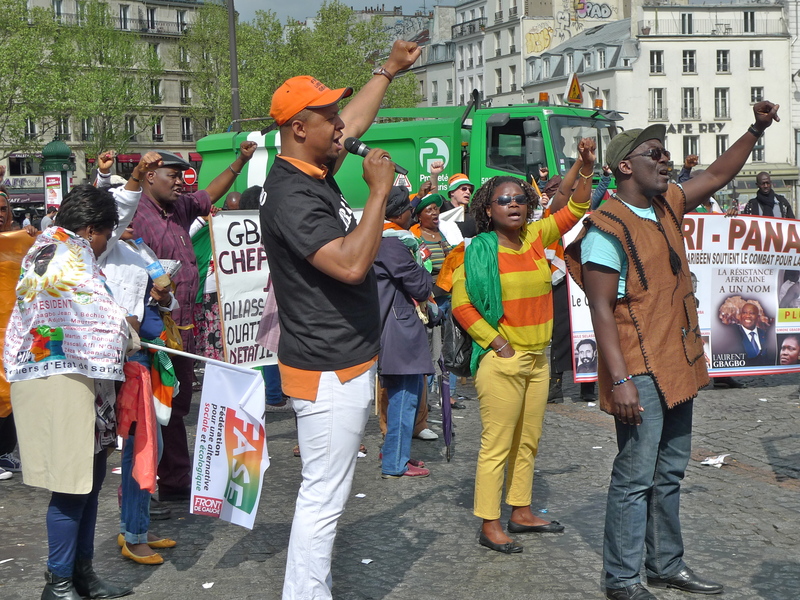 This was the latest in a series of strikes and protests against the bill and further protests are expected at the end of April. The architect of the labour reform bill is Myriam El Khomri, the Minister of Labour, and so the bill has adopted her name, becoming the Loi El Khomri. 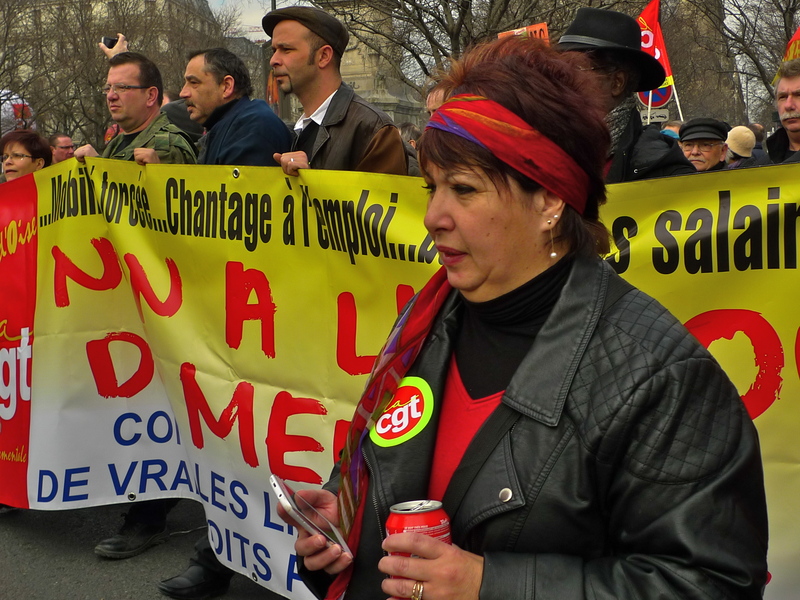 She says the reforms will encourage businesses to hire more workers by deregulating many aspects of France’s notoriously rigid labour laws. 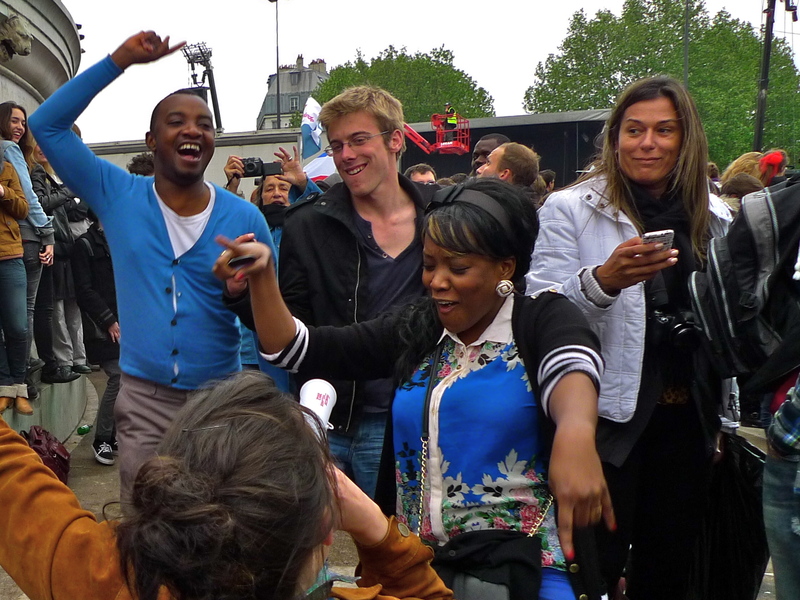 In 2012, François Hollande was elected French President on a pledge to curb unemployment and make ‘youth’ his priority, yet unemployment in France remains stubbornly high at around 10% and unemployment for the under-25s has crept up to an alarming 26%. Hollande, currently the most unpopular president in France’s recent history, has said that he will not run again for the presidency in 2017 if he cannot cut the country’s high unemployment figures and he hopes the labour reforms will encourage firms to hire more staff. However, pressure from the street and from parliament has caused the government to water down the proposals so that they apply only to large firms. 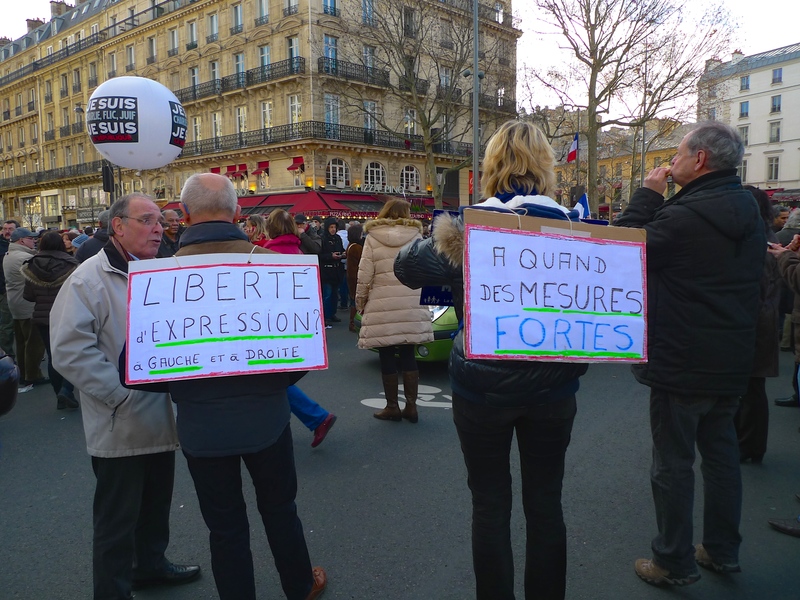 I went Place de la République on Saturday afternoon to mingle with the demonstrators and to record the sounds of protest. 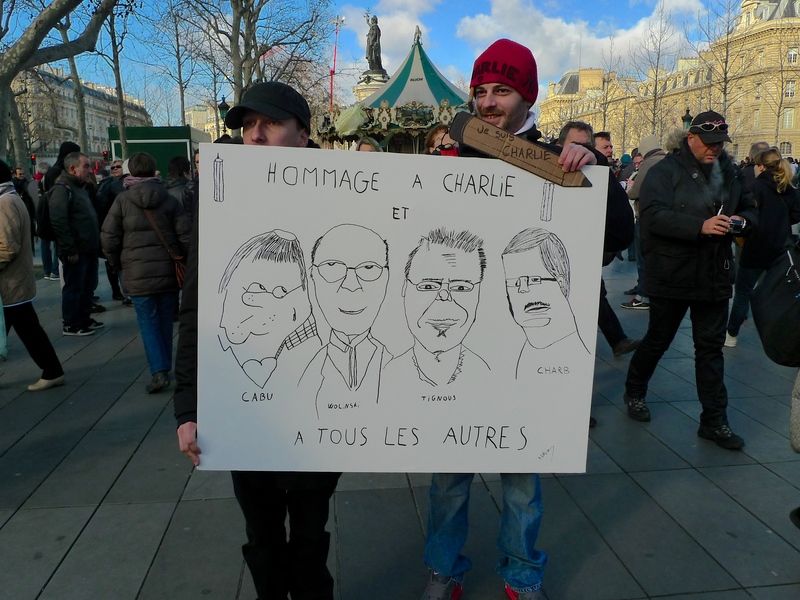 There was an almost festive atmosphere to the manifestation tarnished only by some masked youths who clashed briefly with police near Place de la Bastille. 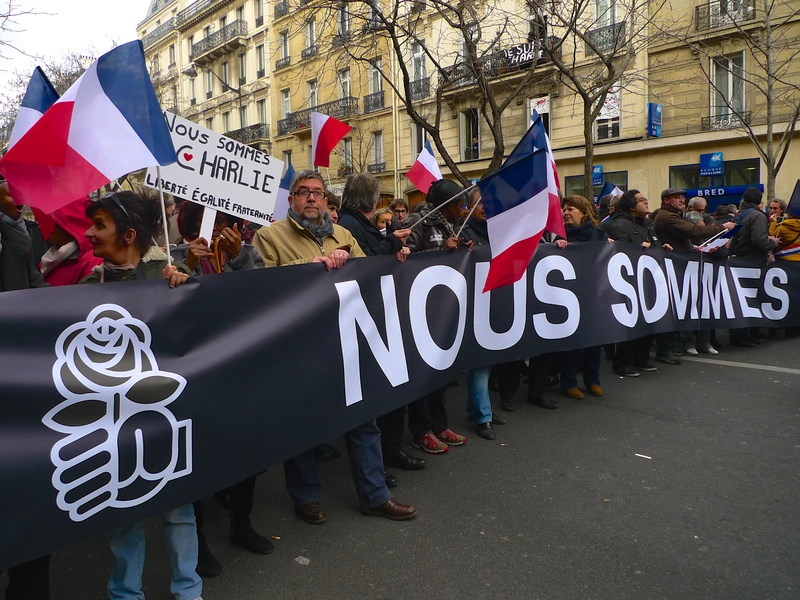 Trouble at large street demonstrations in Paris is unusual and I believe one reason for that is the power of sound. 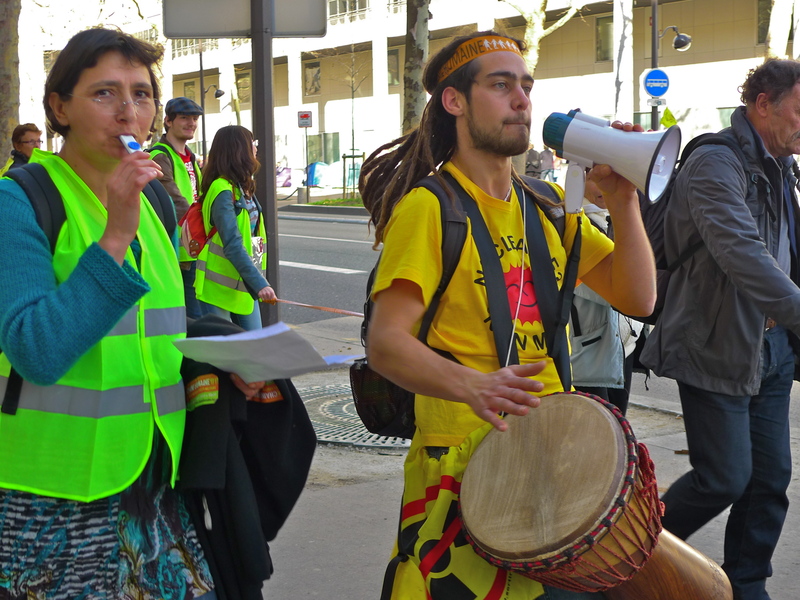 Sound is an integral part of the demonstration; the chanting, with its subtle use of rhythm and repetition, creates a sound architecture that allows the people to speak and to be heard but it also imposes a discipline on the crowd as well as retaining their interest and enthusiasm. It seems to me that if the demonstrators feel that they are acting together in an orchestrated way and that their voice is being heard then perhaps they are less likely to resort to indiscriminate violence to make their point. If you want to know more about the labour reform bill, this is the complete texte du projet de loi El Khomri. 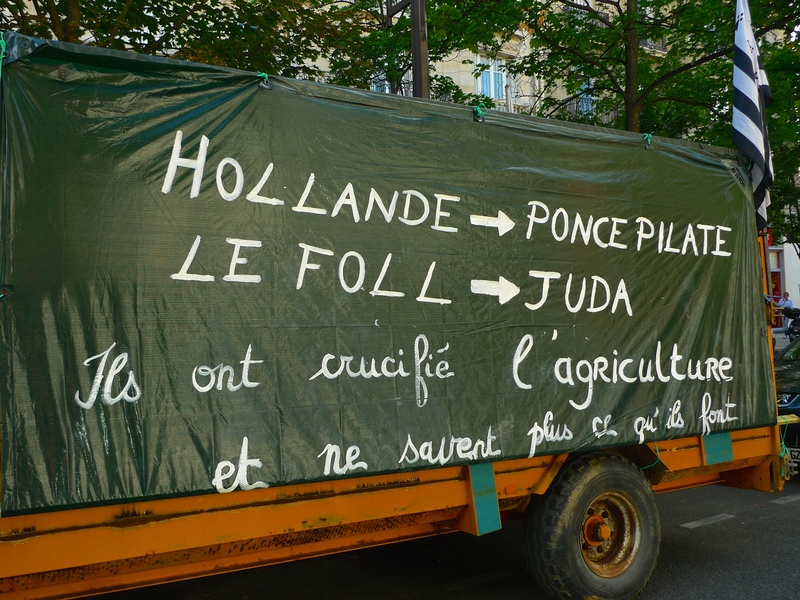 FRENCH FARMERS ARE ANGRY and on Thursday their anger spilled over from the French countryside to the streets of Paris. 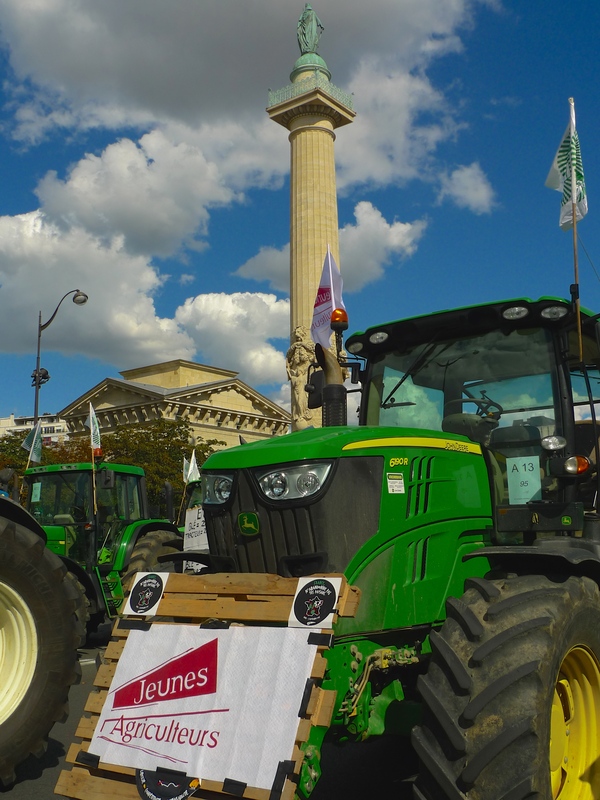 Hundreds of farmers and more than 1,300 tractors converged on the city in the latest protest against collapsing incomes. 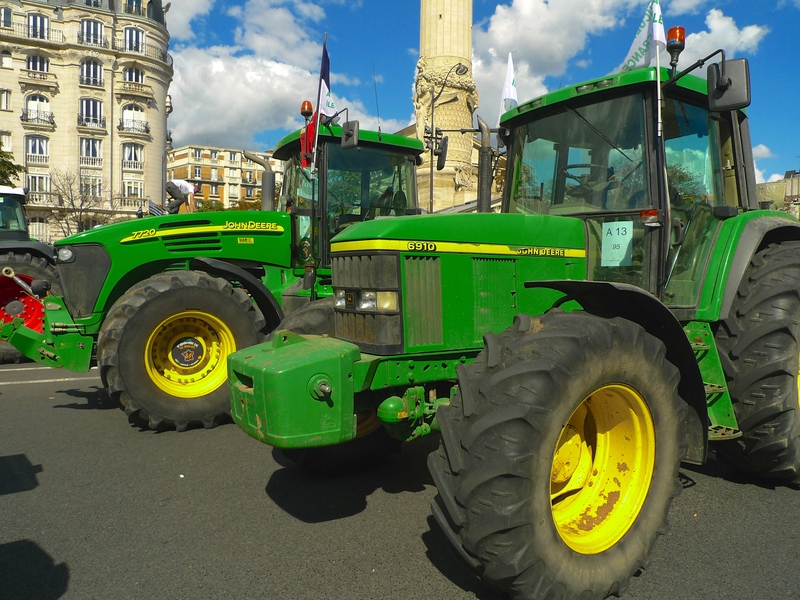 From all parts of the country, farmers and their tractors trundled along the major roads into the capital on Thursday morning. 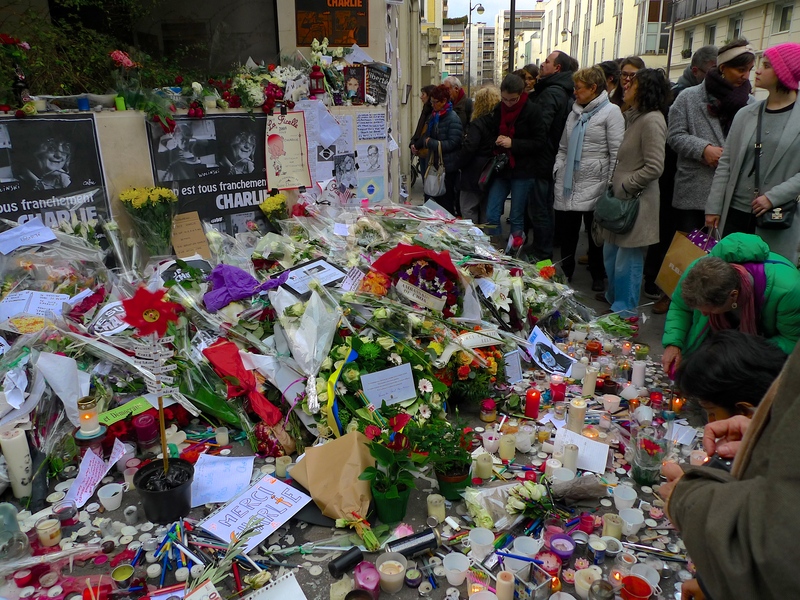 Many Parisian commuters took police advice and travelled to work by public transport to avoid the disruption. 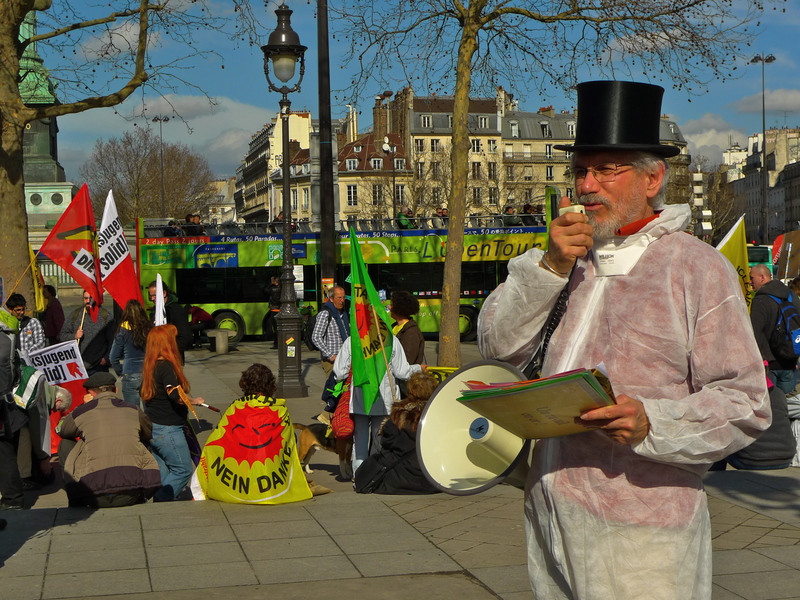 While the farmers were converging on Place de la Nation in the east of the city, their spokesman Xavier Beulin, Président de la Fédération nationale des syndicats d’exploitants agricoles and his delegation were meeting the French Prime Minister Manuel Valls, who is not unsympathetic to their cause. Following the meeting with the Prime Minister, Xavier Beulin addressed the farmers in Place de la Nation on Thursday afternoon. You can listen to their response in the sound piece below. 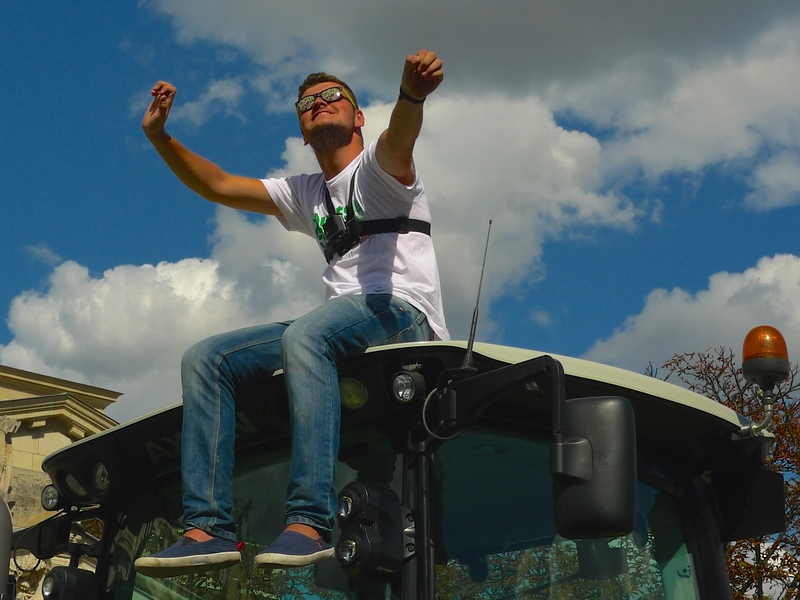 French farmers are facing stiff competition. Production costs in neighbouring countries are much lower, they have been hit by tough competition between supermarkets as well as a Russian embargo on EU food imports, and dairy farmers in particular have seen incomes collapse because of over-production on the world market. 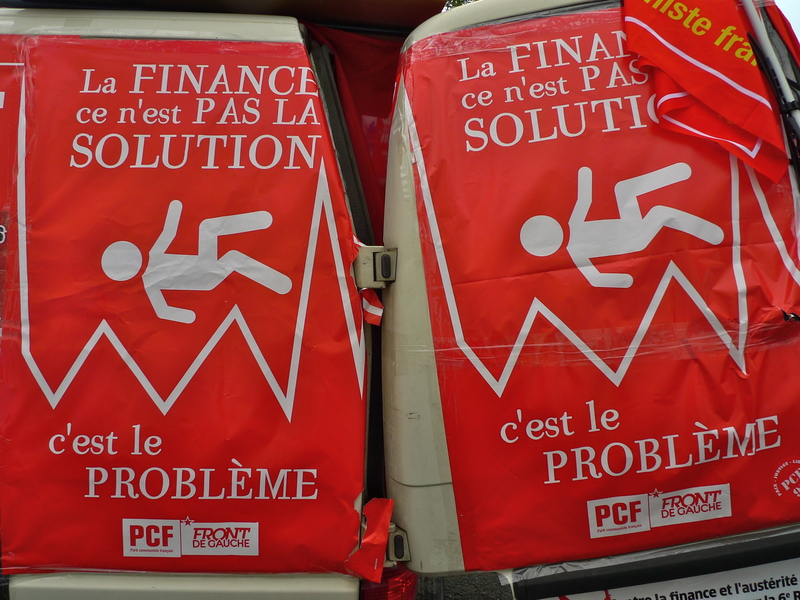 Just six weeks ago, the government came up with a package of debt relief worth €600 million. 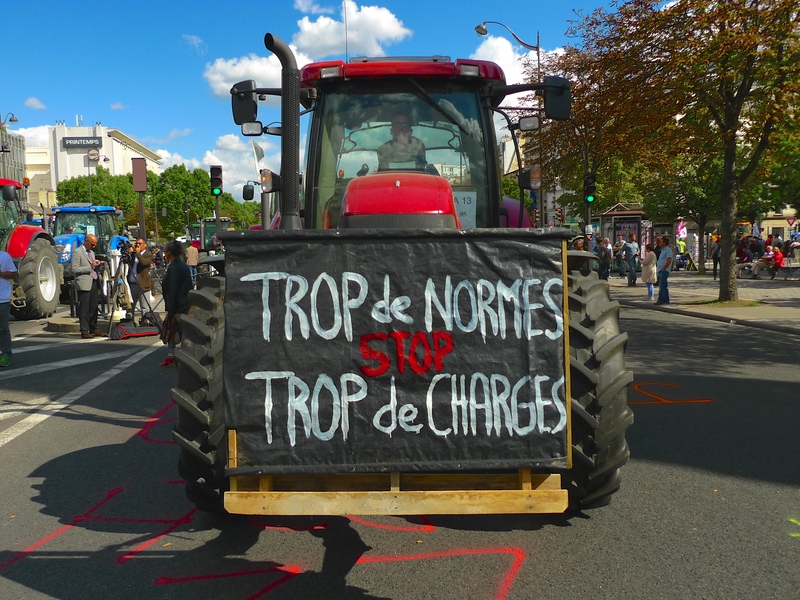 But the farmers say they need much more, arguing that French agriculture is on the verge of collapse. They are seeking tax breaks from the government as well as action from the EU in Brussels. 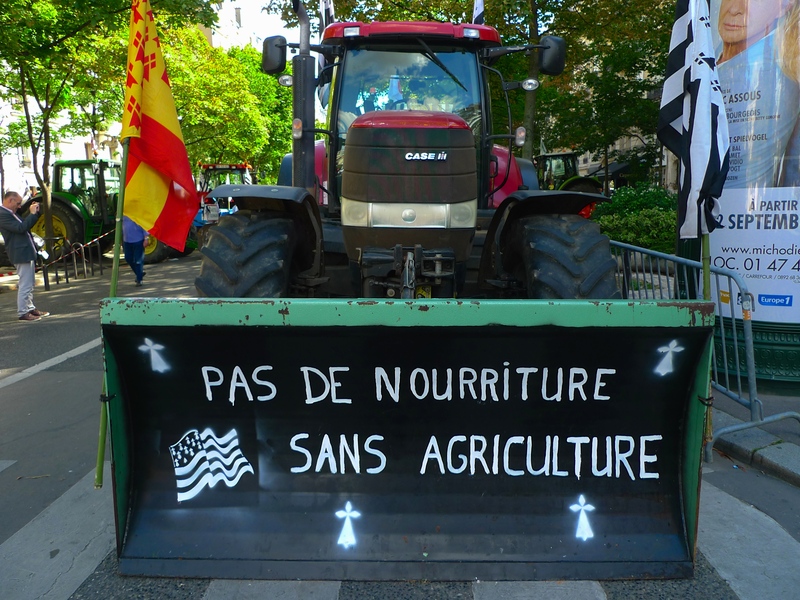 French farmers have been particularly vocal throughout this summer, blocking roads on the German border and targeting major tourist destinations such as the Mont Saint-Michel peninsula. 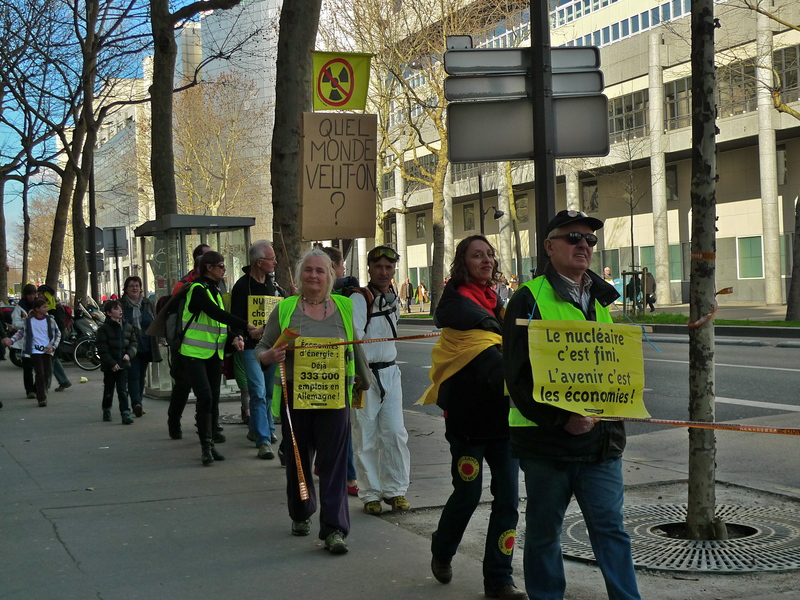 Some of the farmers who were in Place de la Nation on Thursday will be joining a pan-European protest on Monday in Brussels during a meeting of EU agriculture ministers.